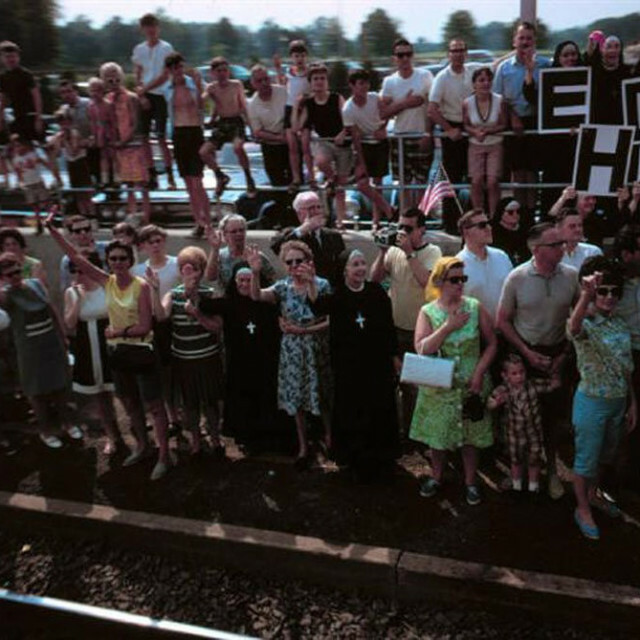 M+B is pleased to announce the exhibition PAUL FUSCO: RFK FUNERAL TRAIN. The opening will coincide with the 40th anniversary of the assassination of Robert F. Kennedy. On a Saturday afternoon on June 5, 1968, Magnum photographer Paul Fusco accompanied the body of Robert F. Kennedy as it made its way from New York City to its final resting place in Arlington Cemetery, near Washington, D.C. Transported by train, the coffin was placed in the last of twenty-two cars and elevated so that it was visible through the large observation windows. However, it was what lay outside the train that interested Fusco most: the track-side mourners who--silent, curious and patient--waited to pay their respects. In vivid color, Fusco's study provides a unique exploration of a nation coming to terms with the loss of a president who never was. It presents a snapshot of a broad range of American citizens and conveys the depth of civic feeling engendered by the tragedy. With their strange blend of valediction and voyeurism, these pictures capture a decisive moment in American history, pictures in which the subject is forcibly absent. In an equally profound way, RFK FUNERAL TRAIN offers a salient and instructive contrast to the diminishing levels of affection that the public holds towards the political classes of today. Paul Fusco was born in Leominster, Massachusetts in 1930. He received his B.F.A. in photojournalism from Ohio University and went directly to work for Look magazine as a staff photographer and traveled extensively in South East Asia, Mexico, India, Europe and Russia. In 1974 he joined Magnum Photos. His work has appeared in many domestic and international publications such as Life, Time, Newsweek, The Sunday Times and Paris Match. He has exhibited at the Metropolitan Museum of Art, New York; San Francisco Museum of Modern Art; Newseum, New York and the Corcoran Gallery, Washington, D.C. RFK Funeral Train was published by Umbrage Editions in 2001, with an introduction by Norman Mailer. Most recently, the Metropolitan Museum of Art in New York acquired six of his photographs from this series.